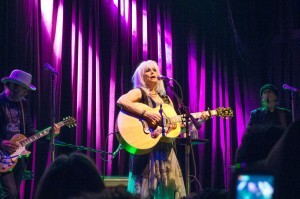 On Sunday night, Lisa and I saw Emmylou Harris in concert. We’ve seen her in concert a couple of times before, but this time was very, very special. It was everything I had ever wanted in an Emmylou concert. Daniel Lanois opened for her and then came back on stage (along with Steven Nistor on the drums and Jim Wilson playing bass) as they played the entire “Wrecking Ball” album! It’s safe to say my first listen to “Wrecking Ball” sometime around 2000 changed my musical world. I had heard Emmylou Harris sing “Goin’ Back to Harlan” on the first Lilith Fair album a couple of years earlier and loved it. “Wrecking Ball” was unlike anything I’d ever heard: beautiful, sad, and poetic with a huge sound that I would later realize was all Lanois. After hearing the album, I became an Emmylou devotee. Being there as Emmylou Harris and Daniel Lanois (and Nistor and Wilson) played all of “Wrecking Ball” was more amazing than I could have expected. And when they played a perfectly rocking version of “Goin’ Back to Harlan”—much like that Lilith Fair recording—I was transported back fifteen years to that first encounter. All of those wonderful years of living with Emmylou’s music were compressed into five perfect minutes. After recreating “Wrecking Ball” for us, Emmylou, Danny, and the band performed a couple of Lanois songs in the first encore (“Still Water” and “The Maker”) along with “Boulder to Birmingham” and “Calling My Children Home.” Emmylou and Lanois came out by themselves for the second (and final) encore, performing a couple older songs by Emmylou: “Pancho and Lefty” and “My Songbird.” That last song is one of my favorites, and I admit that I got a little misty for the second time in the evening, and it was a perfect way to end the show. I can die a happy man now . . . although I’d prefer a few more perfect Emmylou Harris concerts first. Here are some pictures from the show at Boston’s House of Blues. This entry was posted in 101 in 1001, General, This is who we are. Bookmark the permalink. Yes! I am so happy you two had this experience. Boulder to Birmingham is one of my favorites, but I’ve never heard her song it live. She is one of the best things about living in Nashville. There’s a local rule about not bothering famous locals if you see them out. I’ve seen lots of entertainers on the street, and I’ve always obeyed the rules. With the beautiful Emmylou, I’m not sure I would. I’d have to interrupt her long enough to tell her how genius and brilliant she is, and how her music has touched my heart. So excited for y’all. So glad it was a perfect concert. And great photos! Been an Emmylou fan since the 70s, believe it or not, though I can’t claim to be as knowledgeable of everything she’s done as you are. Glad to see I’m not alone. Thanks for sharing!